Front Door Plants—Starting a Topiary Project – Johntheplantman's stories, musings, and gardening. I’ve been working with plants professionally for 35 years or so. During that time, one of the most requested tasks has been to “find me something distinctive to go on the front porch (or by the door).” Usually it takes a lot of time and searching to find just the right plant for the job. It dawned on me several years ago that someone should be growing specially shaped plants for the front porch. It also dawned on me a shorter while back that that “someone” should be me; after all, I’ve been working on the concept for years. 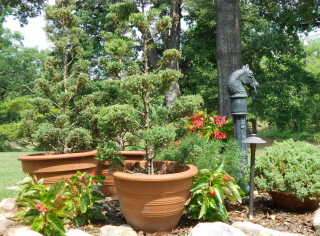 Topiaries in containers are wonderful accents for entry ways. 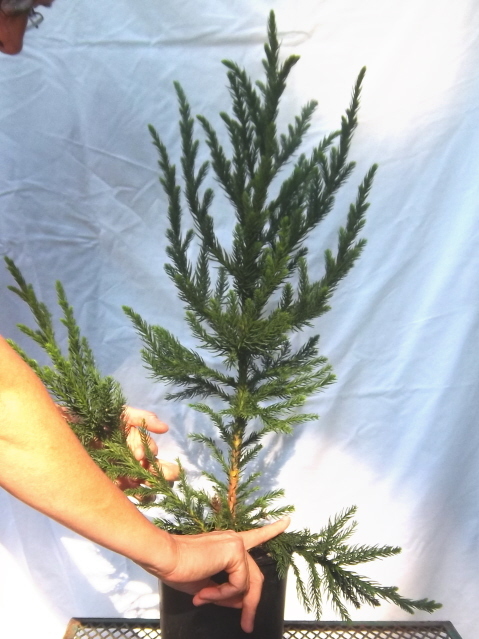 The objective is to grow specimen plants that will finish out somewhere between three and five feet in height. I am thinking that we will grow them in matched pairs because—well, because a door has a right side and a left side. At any rate, we’ll experiment with that as we go. Dekie and I spent a fun afternoon studying one of the plants and figuring out just how we would approach the shaping. To start with, I isolated three main stems (or trunks). Selecting the main stems or trunks for the topiary project. The “apical bud” is the growth bud at the very end of each of the tips. I’m not going to touch this right now. If this apical bud is allowed to grow, it will give me the height that I need. I will watch as this bud develops and elongates, protecting it until I feel that it is at the proper height for cutting. I carefully trim the sides of the three trunks that I selected. 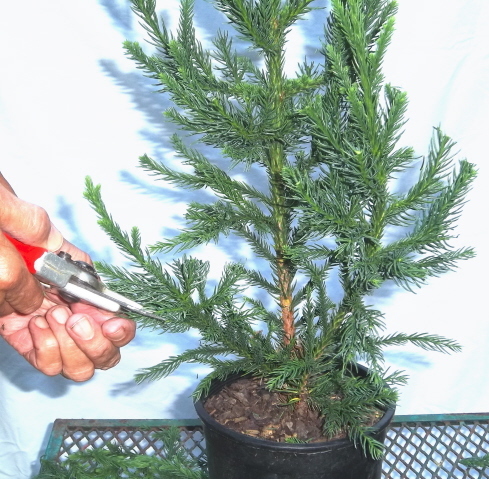 I will cut the “lateral buds” (or sideways growth) to encourage the bottom growth on these trunks to branch out and become lush and full. This means that I will be shaping the bottom sections of the plants while they grow in height. When the two selected sideways trunks grow out to where I want them to be I will cut the tips and begin the shaping process. 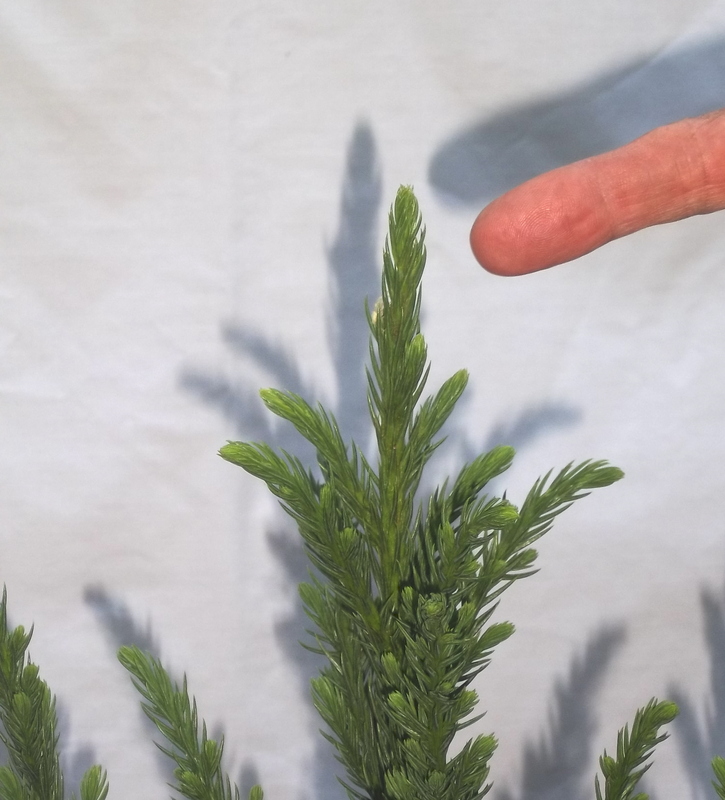 Trimming the side or lateral growth on cryptomeria to induce branching. Over the years I have developed a potting mix using compost, finely ground bark, peat moss, vermiculite, and perlite. I add a bit of lime to adjust the pH and I lace it with just the right dusting of a time-release fertilizer. I think that as the topiary project proceeds I will finish the plants off in five and/or seven gallon containers. For the trial plant, I just planted it in a three-gallon pot to see what happens. 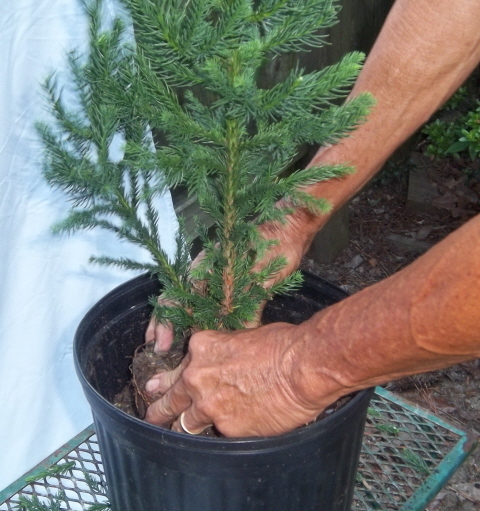 re potting the tree into a three gallon pot for growing on. Here’s a picture of the very first plant for the “Front Door Plants” project. I guess I need to get a bit more professional on my photographic backgrounds—or, I could tell you that I really wanted to show the other side of the fence. 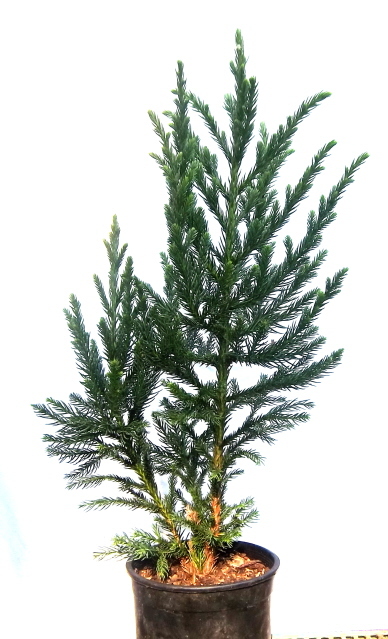 At any rate, the plant is two feet high from the top of the root ball and the side growth has been carefully trimmed. 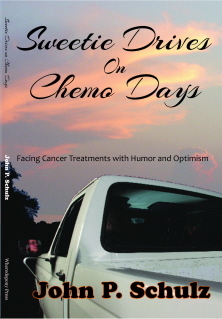 I’m going to set up a special file on the blog and update it periodically. Let’s watch the project develop. I think it will take two to three years to reach the picture I have in my mind. After that, who knows? 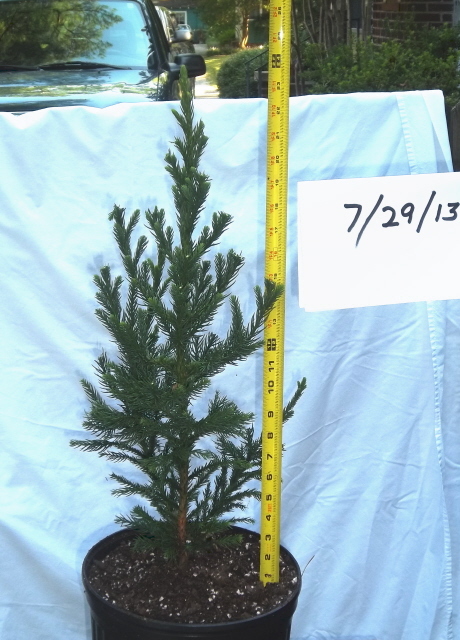 Cryptomeria ‘Black Prince’ topiary started 7/24/13. Approximate height from top of root ball 2 feet. You may wish to check out my article on The Basics of Pruning.